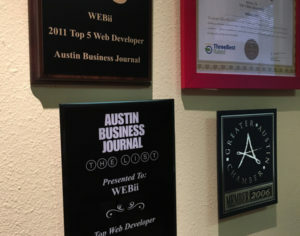 AUSTIN, TX – In the latest issue of its Book of Lists collection of annual business surveys, the Austin Business Journal recognized WEBii in the top 10 Austin web developers. This 2015 business data recognition marks another proud year that WEBii was listed in the top 25 as well as top 10 providers in Austin. In 2016, the company celebrated 20 years of business. Today, the company provides a variety of services including web hosting with dedicated IP services, custom web design, dynamic web development and online application development, and search engine marketing. Noteworthy customers during 2015 included VisionEdge Marketing, Triple Crown Consulting, The Trevor Romain Company, The Lady Bird Johnson Wildflower Center, and the National Constitution Museum. More recently, WEBii reached a milestone of working on projects for departments in three major universities: The University of Texas, Texas A & M, and St. Edwards University. The company continues to enjoy relationships with these types of organizations as well as hundreds of small businesses and non-profits. Other companies included on the Top Web Developers list were SiteGoals, HMG Creative and Springbox.